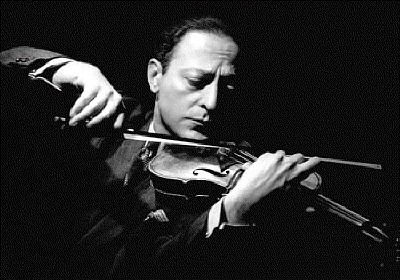 The 20th century violinist Jascha Heifetz remains an ideal for violinists, who revere his playing in an almost religious way. But what was he like as a man? This is what Peter Rosen aimed to explore with his 87-minute documentary, Jascha Heifetz: God's Fiddler, which draws on 300 hours of film and 2,000 photos. You may recall that I wrote about its premiere last spring. This week we are giving away three copies of the documentary, which was recently premiered in New York and is now available in DVD form. Congratulations to Roland Garrison of Tigard, Oregon, who won the first DVD! There are still two more to win, and we've just put up the next question. To enter for a chance to win, please go to our contest page. Definitely a potential Christmas present! One question - is it an "All Regions" coded DVD? I.e. one which will play on European/UK systems as well as on American ones? Not sure if it runs in UK-style machine, will check. Here is an item in the New York Times about the documentary.